Vassar (21-6) fell to SUNY Geneseo, 74-55, in the first round of the NCAA Division III tournament March 1 in Amherst, MA. Ryan DeOrio ’21 led all Vassar scorers with 16 points. Sophie Nick ‘20 had 12 points and six rebounds. Maddie Leong ’19 was named Liberty League Defensive Player of the Year, and Vassar Head Coach Candice Brown-Signor and Assistant Claire Mattox were named Liberty League Coaching Staff of the Year. Three others received league honors. Nick was named to the All-Liberty League First Team; Jackie Cenan ’20 was named to the Second Team; and Isa Peczuh ’20 received Honorable Mention. 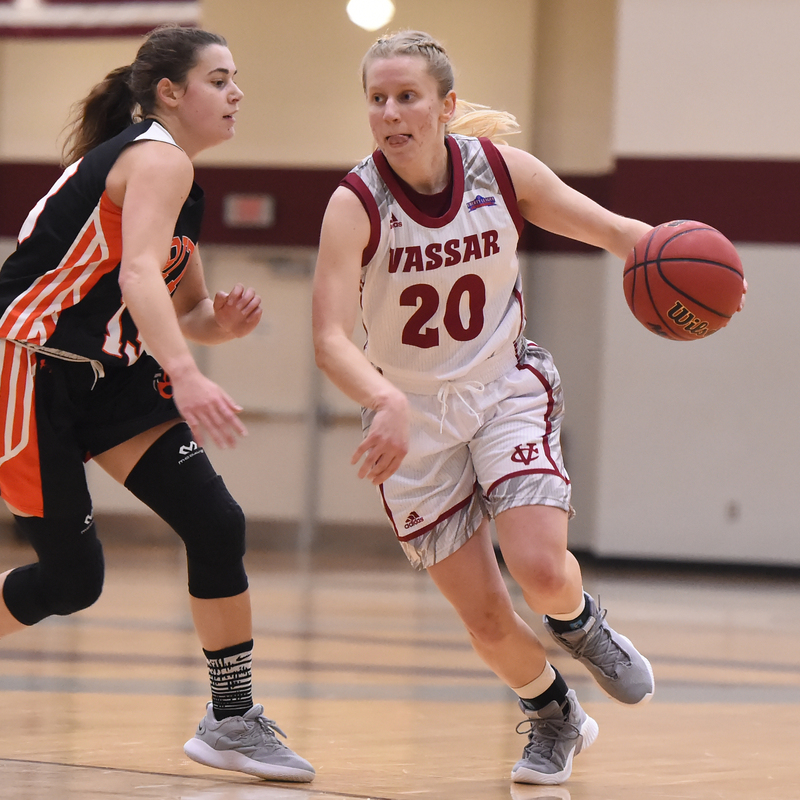 Vassar fell to Rochester Institute of Technology, 70-62, in the semifinals of the Liberty League Tournament Feb. 23 at Ithaca College. Nick scored 23 points, and Peczuh added 16. The Brewers led, 43-42, with 5:33 remaining in the third quarter, but the Tigers went on a 10-0 run, and Vassar never caught up. 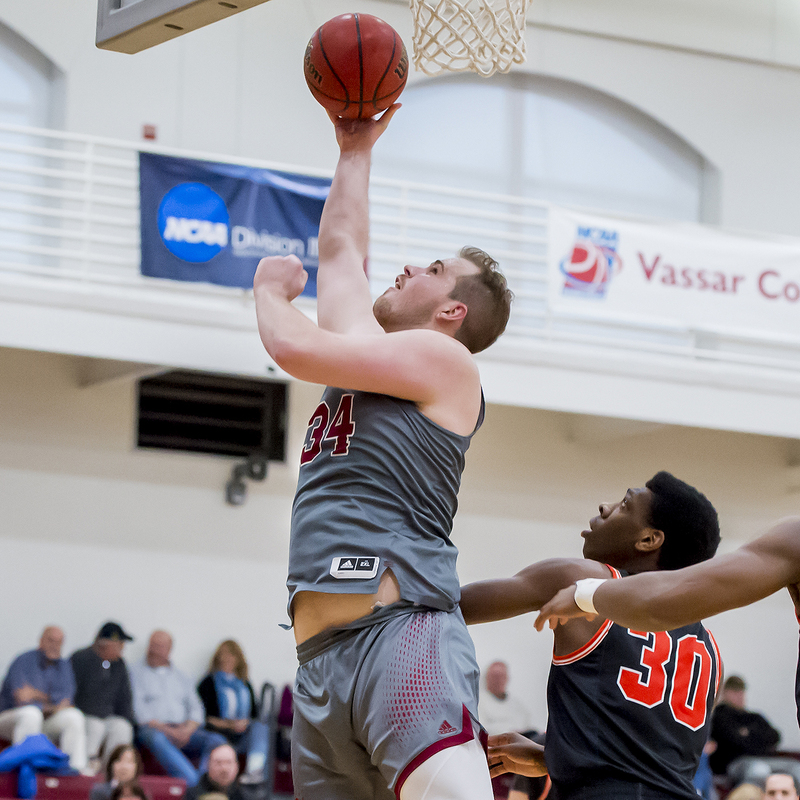 Peczuh and Nick combined for 47 points in Vassar’s 71-53 victory over Skidmore in the first round of the Liberty League playoffs Feb. 19 at the Athletics and Fitness Center. Peczuh drained eight three-point shots in 12 attempts and finished with 26 points. Nick scored 21 points and grabbed five rebounds. A third-quarter Vassar surge fell short, and the Brewers lost to Liberty League regular season champion Ithaca College, 64-55, Feb. 16 at the Athletics and Fitness Center. Nick scored 23 points and grabbed 13 rebounds. Peczuh scored 23 points, but Vassar fell to William Smith College, 70-67, Feb. 15 at the Athletics and Fitness Center. DeOrio finished with 16 points. Cenan, the Brewers’ second leading scorer, suffered a season-ending knee injury during the game. Nick scored the 1,000th point of her Vassar career and led the Brewers to a 56-38 win over Rensselaer Polytechnic Institute Feb. 9 on the RPI campus in Troy, NY. Nick finished with 15 points and eight rebounds. Rochester Institute of Technology snapped Vassar’s 16-game winning streak Feb. 8 on the RIT campus in Rochester, NY. The Brewers took a 49-47 lead into the fourth quarter, but were outscored, 25-9, the rest of the way. Cenan led all Vassar scorers with 17 points. Nick added 16. Nick scored 15 points and grabbed 14 rebounds in Vassar’s 57-51 win over Union College Feb. 2 in Schenectady, NY. Cenan scored 14, and DeOrio chipped in with 10. Nick paced the Brewers to a 77-55 victory over Bard College Feb. 1 in Annandale-on-Hudson NY. Nine other Vassar players scored at least five points. Vassar (11-14, 7-11 Liberty League) finished the season with an 89-62 loss to Ithaca College Feb. 16 in the Athletics and Fitness Center. Paul Grinde ’19 capped his collegiate career with a game-high 16 points and nine rebounds. Mason Dyslin ’19 scored 12. Grinde became the 17th player in Vassar history to score 1,000 points, propelling Vassar to a 104-101 double overtime victory over Hobart College Feb. 15 in the Athletics and Fitness Center. Grinde finished with 29 points. Alex Seff ’19 scored 20, and Lance Tebay ’21 added 19. Rensselaer Polytechnic Institute defeated Vassar, 66-54, Feb. 9 on the RPI campus in Troy, NY. Zach Bromfeld ’21 paced the Brewers with 14 points, five rebounds, and one blocked shot. Bromfeld scored at the buzzer to lift Vassar to a 75-73 win over Rochester Institute of Technology Feb. 8 on the RIT campus. The winning play was set up by a steal by Tebay with 16 seconds remaining. A shot by Seff was off the mark, but Bromfeld grabbed the rebound and sank the winning layup. Seff recorded his first double-double of the season as Vassar defeated Union College, 61-55, Feb. 2 in Schenectady, NY. Seff finished with 20 points and 11 rebounds. Tebay had 14 points, and Dyslin added 10. Vassar suffered shooting woes in the second half and lost to Bard College, 76-67, Feb. 1 on the Bard campus in Annandale-on-Hudson, NY. The Brewers converted just 12 of 35 shots in the final 20 minutes. Seff and Tebay scored 14 and 13 points, respectively. Jesse Ecklund ’22 won the 200-yard backstroke and qualified for the NCAA Championships at the Liberty League Championships Feb. 23 on the Ithaca (NY) College campus. Ecklund broke the meet record with a time of 2:00.82. Ecklund also teamed with Angharad Healey ’21, Brynn Lautenbacher ’21, and Violet Witchel ’22 in setting a school record in the 400 freestyle relay. The Brewers finished fourth in the league tourney. Ecklund set two pool records to lead Vassar to a first-place finish at the Skidmore Sprint Invitational Feb. 3 in Saratoga Springs, NY. Ecklund eclipsed the pool mark in the 100 backstroke with a time of 1:00.55 and set another record in the 50 backstroke with a time of 28.60. She also won the 500 freestyle. Lautenbacher won the 50 butterfly, the 100 butterfly, and the 100 individual medley, and she was a part of the winning 200 freestyle relay team. Other members of the relay team were Meg Harrington ’19, Kendall Hayes ’22, and Violet Witchel ’22. Max White ’21 won a pair of gold medals at the Liberty League Championships Feb. 21-24 at Ithaca (NY) College. White posted a potential NCAA qualifying time of 4:35.18 in his victory in the 500-yard freestyle Feb. 21. The following day, White won the 200 freestyle. Jake Mier ’22 set a school record in the 200-yard butterfly. Anthony Tobin ’22 finished fifth overall in three-meter diving and sixth in the one-meter event. Vassar swept the top three spots in both butterfly events and went on to win the Skidmore Sprint Invitational Feb. 2 in Saratoga Springs, NY. Matthew Imiolek ’20, Harrison Taylor ’20, and Nikolas Pham ’22 finished 1-2-3 in the 50. White, Taylor, and Jordan Kalina ’20 swept the 100. Imiolek also won the 50 freestyle, and he teamed with Brandon Li ’22, Pham, and White to win the 200 freestyle relay. Vassar (8-4, 2-2 United Volleyball Conference) posted straight-set victories over Sage College and Augustana College Feb. 21 at Kenyon Hall. Jefferson Waters ’22 had a team-high 11 kills in the win over Sage. Matt Usui ’22 had 10 digs. Kevin Ros ’20 had 11 kills in the victory over Augustana. The Brewers lost in straight sets to Massachusetts Institute of Technology Feb. 16 on the MIT campus in Cambridge, MA. 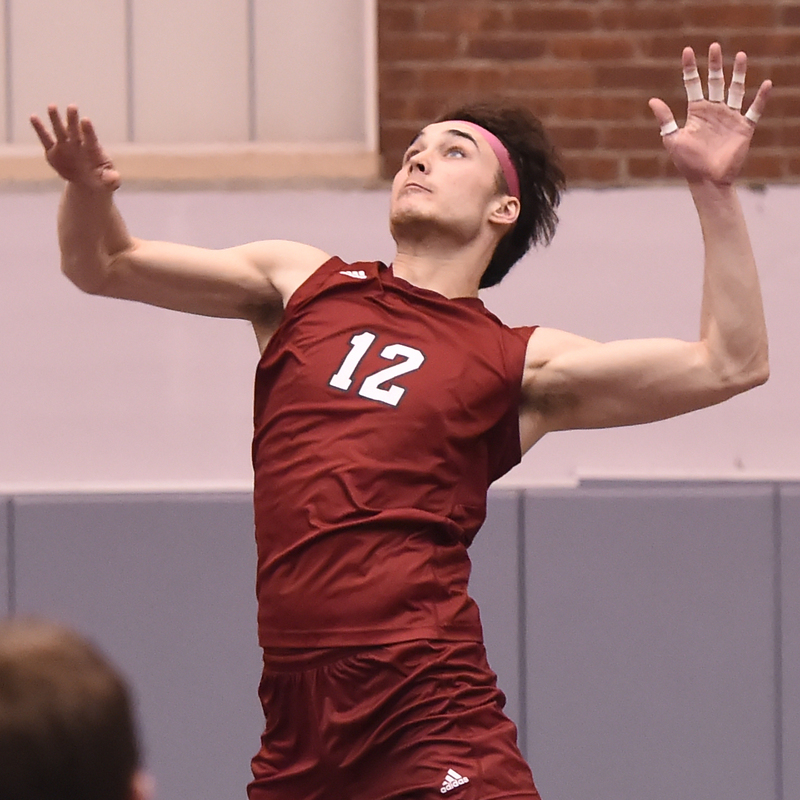 Jake Kaplan ’22 led all Vassar hitters with 10 kills. Waters had 26 assists. Vassar posted victories over Bard College and Johnson & Wales University Feb. 9 at Kenyon Hall. The Brewers swept Bard three sets and defeated Johnson & Wales in four. Sean Hsu ’21 had nine kills in the win over Bard. Kaplan had 19 kills in the match against Johnson & Wales. Vassar fell to the third-ranked team in the country, SUNY New Paltz, in four sets Feb. 7 at Kenyon Hall. The Brewers dropped the first set, 25-17, won the second, 25-16, and lost the next two by identical scores of 25-20. Waters finished with 12 kills, five digs, and four blocks. Ros had 29 assists. Vassar lost a see-saw match to top-ranked Springfield College Feb. 2 on the Springfield (MA) campus. The Brewers lost the first set, 25-10, but came back to take the second, 28-26. Springfield cruised to a 25-12 win in the third set, and the Brewers fell just short in the fourth set, 25-23. George Diehl ’19 had 11 kills, and Ros and Kaplan each had 10. Ros had 21 assists and seven blocks. The Brewers defeated New York University in five sets Feb. 1 on the Springfield campus. Waters had 18 kills, including one on the clinching point of the match. He also posted 11 digs and four blocks. Kaplan and Diehl each had nine kills. Rose Hulsey-Vincent ’19 and Zoe Tolbert ’22 were named Eastern Women’s Fencing Conference Fencers of the Year at the EWFC Championships Feb. 17 in New York City. The Brewers’ epee squad was undefeated in all seven rounds of the tournament. Vassar (33-14) finished third overall, losing to Johns Hopkins University and Stevens Institute of Technology. The Brewers defeated Drew University, Hunter College, Haverford College, New York University, and Yeshiva University. Vassar lost a pair of matches to Columbia University and New York University on the Columbia campus Feb. 13. The Brewers lost to Columbia, 23-4, and to NYU, 17-10. Foil competitors Tolbert and Tori Lubin ’22 each won two of their three matches against NYU. Shannon Chen ’21 posted three epee victories against Columbia. Vassar posted victories over seven squads Feb. 9 at the Northeast Conference Multi-Meet in Boston, MA. The Brewers defeated the University of Massachusetts, Boston University, Dartmouth College, Smith College, Wellesley College, Sacred Heart University, and the University of New Hampshire. In the final round match against New Hampshire, Mirit Rutishauser ’19 and Lubin were undefeated in foil. Chloe Chinnadurai ’22 was undefeated in epee, and Rose Parker ’22 and Nicoletta Dinelli ’21 posted 3-0 sweeps in sabre. Yale University defeated Vassar, 23-4, Feb. 2 on the New Haven (CT) campus. Sophie Blumenstock ’19 and Tolbert each posted a win in foil. The Brewers (26-19) lost to NYU and Columbia Feb. 13 on the Columbia campus. 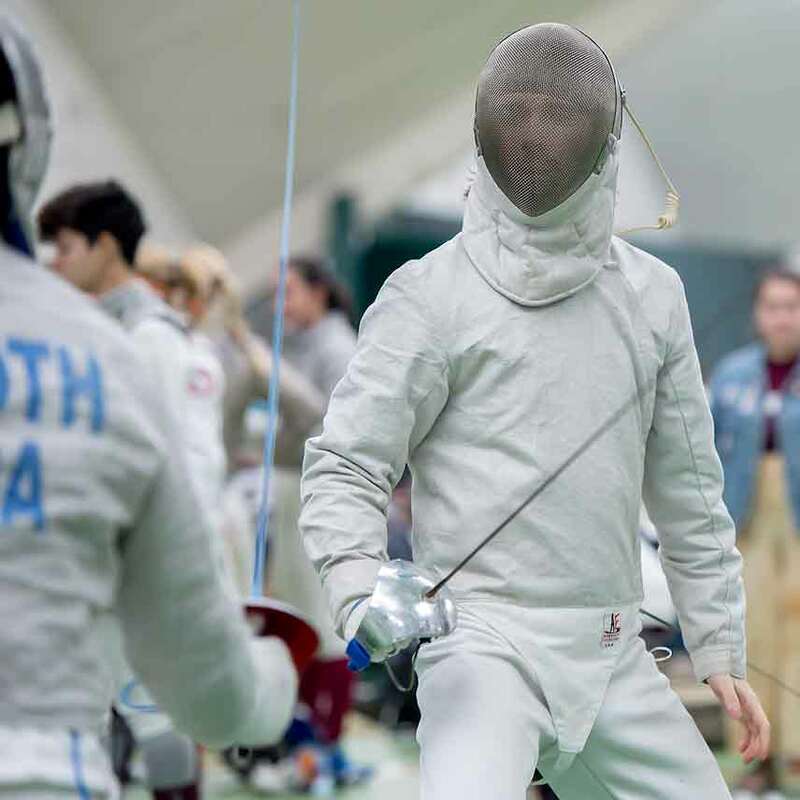 Max Deak ’22 and Graeme Mills ’20 each tallied two victories in sabre in the loss to NYU. Chris Gaehde ’22 was 2-1 in foil in the loss to Columbia. 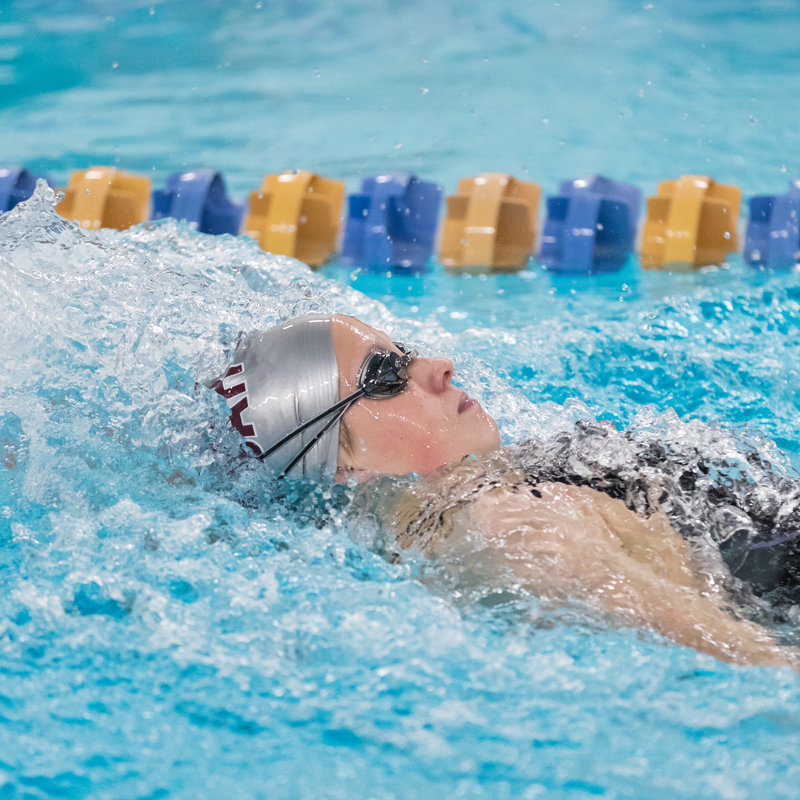 Vassar lost to Sacred Heart University but defeated four other teams at the Northeast Conference Multi-Meet Feb. 9 in Boston. The Brewers posted victories over the University of Massachusetts, Boston University, Dartmouth College, and the University of New Hampshire. Noe Berger ’20 (foil), Gaehde (foil), Nishay Bhatnagar ’22 (epee), Deak (sabre), and Tom Possidente ’19 (sabre) were among Vassar’s top performers. Vassar’s epee squad won six of nine bouts, but the Brewers fell to Yale University, 17-10, Feb. 2 on the Yale campus. Aiden Pierson Smela ’22 and Michael Jaklitsch ’21 each won three bouts. Vassar (12-11) won the Collegiate Squash Association Division E Chaffee Cup Feb. 24 in Hartford, CT. The Brewers defeated Bowdoin College, 7-2, in the finals. Claire Coss ’22 won her No. 2 match in five seats. Julia Pollak ’19 bounced back at No. 3 after losing her first set by winning the next three. The Brewers reached the finals by defeating Bard College, 9-0, and Colgate University, 6-3, on Feb. 23. Vassar blanked Wellesley College, 9-0, but lost to Mount Holyoke by the same score at the Seven Sisters Championships Feb. 9 on the Mount Holyoke campus in South Hadley, MA. Sydney Nemphos ’20 won her match against Wellesley at No. 1. Nemphos and Coss were named to the All-Tournament Team. Pollak dropped a competitive match against her Mount Holyoke opponent, losing 11-8, 11-6, 11-6. Vassar defeated Bard College, 9-0, but lost to William Smith and St. Lawrence at the Liberty League Championships Feb. 2 and 3 in Canton, NY. Nicole Pihlstrom ’22 was Vassar’s only winner in the loss to William Smith. Pihlstrom also won her match against her Bard opponent. Nemphos won three straight games against her Bard opponent at No. 1. Vassar (7-15) finished third in the Collegiate Squash Association’s Hawthorn Cup G Division tournament Feb. 16 in Stamford, CT. The Brewers defeated Siena College, Ohio State University, and the University of Notre Dame but lost to eventual champion Colgate University. No. 1 Viraj Nadkarni ’20 defeated his Notre Dame opponent in four seats. Isaac Stuart ’19, Henry Mitchell ’22, Travers Parsons-Grayson ’19, Milind Joshi ’21, and Reese Colins ’22 also posted wins in the third-place match. Nadkarni and Caden Gruber ’19 each won a pair of matches as Vassar defeated Siena College, 9-0, but lost to Colgate University, 5-4, Feb. 9 on the Colgate campus in Hamilton, NY. The Brewers won two of nine matches against Bard College but were swept by St. Lawrence, Hobart, and the University of Rochester at the Liberty League Championships Feb. 2 and 3 in Canton, NY. Stuart and Mitchell posted Vassar’s only wins. Vassar (5-3) finished second at the Seven Sisters Championships Feb. 23 and 24 at Walker Field House. The Brewers defeated Bryn Mawr, 4-1, and Smith College, 5-0, on Feb. 23. They blanked Mount Holyoke, 5-0, before losing in the finals to Wellesley College, 4-1, on Feb. 24. Tara Edwards ’20 and Morgane Flournoy ’19 were named to the All-Tournament Team. Frances Cornwall ’21, playing at No. 1 singles, won her semifinal match, 6-0 and 7-5, but she lost in three sets in the finals. The Brewers were swept by Massachusetts Institute of Technology Feb. 16 on the MIT campus in Cambridge, MA. Flournoy and Ashley Fair ’20 lost a close doubles match, 8-6, at No. 3. Cornwall earned a victory at No. 1 singles in Vassar’s 7-2 loss to the U.S. Military Academy Feb. 9 on the West Point campus. The doubles team of Melina Stavropoulos ’22 and Sarra Yekta ’21 won their doubles match. Vassar (4-2) cruised past Clark University, 9-0, Feb. 23 on the Clark campus in Shrewsbury, MA. The No. 1 doubles team of Allen Sokolov ’20 and Jeremy Auh ’20 won their doubles match, 8-5. David Gandham ’21 rallied from a set down to defeat his opponent, 2-6, 6-2, 7-5, in No. 1 singles. 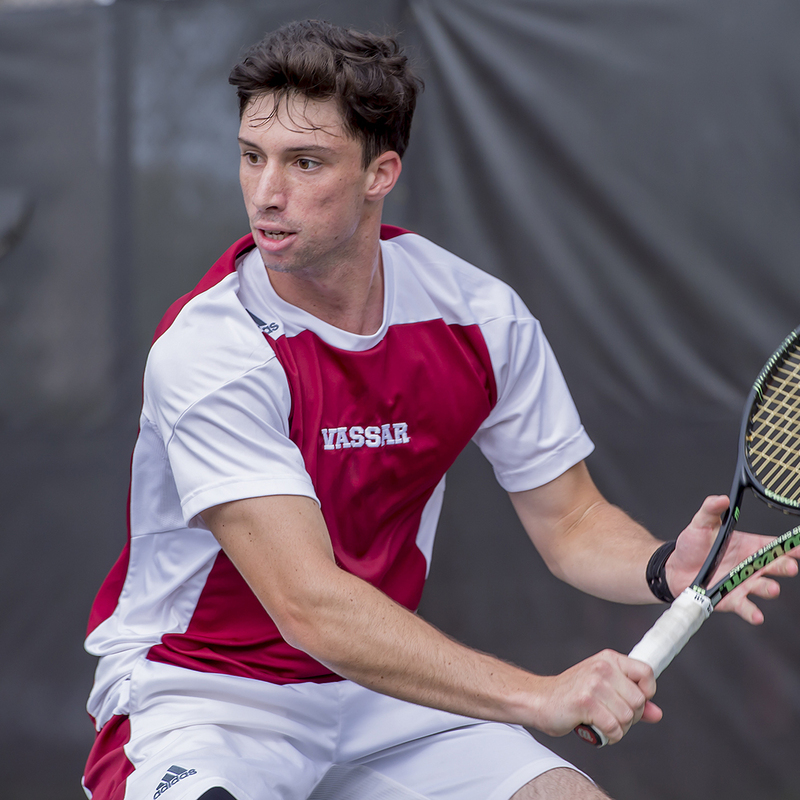 Sokolov posted Vassar’s lone victory in an 8-1 loss to Skidmore College Feb. 16 in Wilton, NY. Vassar lost to the University of Rochester, 5-4, Feb. 9 but swept Rochester Institute of Technology, 9-0, Feb. 10 at Walker Field House. Gandham won his No. 1 singles match against Rochester. In the match against RIT, Matthew Yee ’22 won his No. 1 singles match, and Sokolov and Auh won their No. 1 doubles match. Michael Mullin ’20 scored three goals, but Vassar (1-1) fell to Montclair (NJ) State, 10-8, Feb. 27 at Weinberg Field. Spencer Duryee ’22 scored twice. Vassar opened the season with a 10-6 win over Drew University Feb. 23 on the Drew campus in Madison, NJ. Logan Hyde ’22 scored four times in his collegiate debut. Mullin had a goal and two assists.